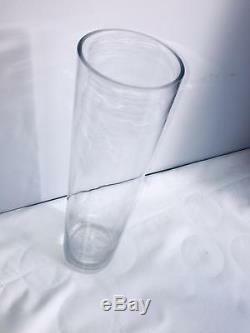 Handmade 100% Clear Glass Cylinder Vase. 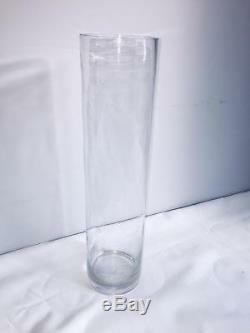 Our tall cylinder vases are the perfect choice for home or event! 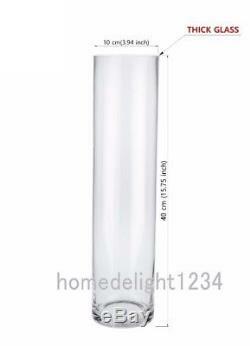 The elegant, handmade, clear glass, cylinder shaped large vase make this an easy addition to any setting. An excellent addition to any home. 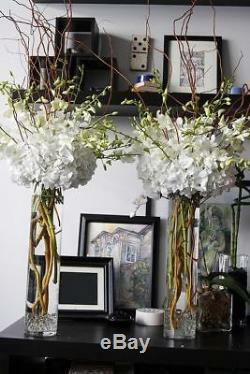 Great for any floral arrangements. 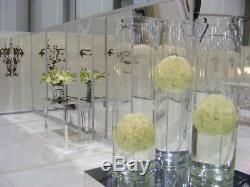 Perfect way to display your favourite flowers. 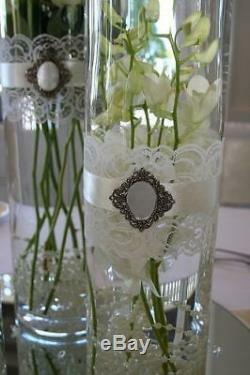 Classic collection of handmade vases. Designed for easy usage and storage. Original & thoughtful gift idea. 40cm/16 tall and 10cm top diameter. Please note: This is a handmade item therefore occasional minor bubble inclusions may happen. Please check the postal codes below that this charge applies to. Scottish Highlands and islands:- Inverness- IV1-3, IV4-36, 40, IV52-54. Isle of Skye- IV41-49, 51 and IV55-56. Wick and Thurso- KW1-3, KW5-14. Northern Ireland, Isle Man/Scily:- Isle of Man- IM1-9 and 99 Isle of Scilly- TR21-25. Northern Ireland- BT21-26, BT29-35, 38-46, 49-61, BT66-73, 75-91, BT47, 48, 62-65, BT74, 94, 92-94. All items are handmade or blown glass vases. 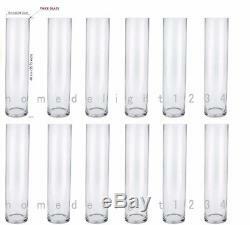 They are originally made in metric, then we converted to nearest inches easier for our customer to visualize. If you need exact dimensions, please contact our office to have our rep to get the exact dimensions for you. All the opening diameter and height are measured from outside to outside of the glass, inside diameter or height would vary depending on each vase. 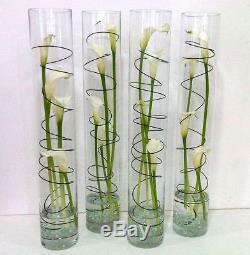 When we make the vase, we can only control the outside opening diameter or heights. Since they are all handmade/mouth blown glass vases, if you look carefully, they might have very minute slight differences among each vase. Tiny differences are a natural part of glass vases, they are a by-product of any liquid glass when they are cooled, but it is very minor that most people do not notice it. Please verify all orders before submitting. Make sure you check all your items upon arrival for damages, defects, size measurements, do not wait until the last min to do that. You would be responsible for the return of all items in its original condition, and original box. Please notify us before returning any items. If the item you received is damaged or incorrect. Please follow the following procedure. All Claims has to be filed within 14 days of receipt of the product. Past that time, it may be denied. Please take a picture of the broken item and its packaging, please do not remove broken glass out of the box unless you feel it is safe to do so. You can open the lid of the box a little, and take a vertical picture from the top down, and that should be good enough. Message us all corresponding materials. Upon acceptance of your claim, we will credit you back. There will be no replacement for damaged items, unless under special circumstances. Claim on this case would be handled as a separate case, if you need replacement, it will have to be re-ordered. The claim will be sent as a credit back to the charge card as currier company credit us. Claim approval solely depends on the trucking company/Parcelforce, of course, we do our best to get you the full amount claimed. 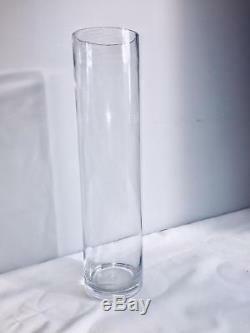 The item "12x40cm/16TALL 10CM TOP AND 5mm THICK GLASS CYLINDER VASE / TABLE CENTERPIECE" is in sale since Friday, July 27, 2018. 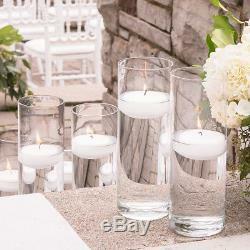 This item is in the category "Home, Furniture & DIY\Wedding Supplies\Other Wedding Supplies". The seller is "homedelight1234" and is located in Brierley hill, West Midlands. This item can be shipped to United Kingdom, Austria, Belgium, Bulgaria, Croatia, Cyprus, Czech republic, Denmark, Estonia, Finland, France, Germany, Greece, Hungary, Ireland, Italy, Latvia, Lithuania, Luxembourg, Malta, Netherlands, Poland, Portugal, Romania, Slovakia, Slovenia, Spain, Sweden, Australia, United States, Canada, Brazil, Japan, New Zealand, China, Israel, Hong Kong, Norway, Indonesia, Malaysia, Mexico, Singapore, South Korea, Switzerland, Taiwan, Thailand, Chile.